Keeping up with the latest mobile devices available for your warehouse isn’t something most companies excel at. When it comes time to invest in a mobile device or upgrade an existing device, people need to research options and decision-makers will have questions. Below, we ‘re providing insight into a few of the most frequently asked questions when it comes to selecting a mobile device. When should I consider using a tablet in the warehouse? Tablets can be very useful in a warehouse environment, but generally not as a handheld device. Mounted tablets can add value, but using it as a handheld device with an external scanner ties up hands and is not ergonomic. Even tablets with built-in scanners can be cumbersome to use when compared to mobile computers or devices with pistol grips. Moving inventory while handling a tablet and a scanner is not efficient for full-time warehouse workers. Tablets may perform well when they can be mounted, eliminating the need for the user to hold it thereby freeing up hands to do other tasks. For example, a tablet (or vehicle-mounted mobile computer) mounted on a forklift makes a lot of sense. In this scenario, a simple barcode scanner will be interfaced with the computer (wired or wirelessly). Forklift operators can easily scan barcodes from the comfort of their forklift seat and interact with the computer easily while still being able to operate the forklift. A similar scenario includes cart mounted tablets (or mobile computer). Warehouse workers don’t need to hold the tablet and are free to pick and put-away inventory. The one downside is when scanning items, the tablet isn’t always visible which can make it difficult for the worker to verify the scan. While enterprise or industrial grade tablets are available, their durability and risk of accidental breakage don’t measure up well to rugged mobile computers, especially for the cost – when tablets do offer the same drop spec as handhelds, they are often much more money. Handling a tablet increases the risk of dropping and damaging it where mounting a tablet mitigates the risk of breakage. Other environmental conditions including temperature extremes (ambient/freezers/ovens/furnaces) and moisture (rain/snow/humidity) should also be considered when selecting a mobile warehouse device. Battery life can also be a factor with tablets. The larger screen size, processor requirements, and other factors cause tablets to use much more battery power than a typical handheld device. Screen technology can also be an important factor: most industrial tablets (and all modern consumer tablets) use a capacitive touchscreen, while typical mobile computers use a resistive screen. Capacitive screens allow you to lightly touch the screen to interact with it – just like your current smartphone. Resistive screens require you to put pressure on the screen for it to recognize the “tap”. You might be thinking that capactive sounds much better, but in a warehouse environment, it’s not: capacitive screens don’t work when wearing normal work gloves (you need gloves made to work with touch screens); capacitive screens are at significant risk for generating unwanted inputs – a slight accidental touch while grabbing the device could register an activity in the software that would then have to be fixed, assuming the error was noticed at all – this is much less likely with resistive screens that only react when pressure is applied; and finally, if the user needs to be more accurate with their input, such as when typing on an on-screen keyboard, they must use a capacitive stylus rather than anything that can put pressure on the screen (like a normal pen). Are tablets a good alternative to paper-based systems when used in manufacturing? Manufacturers who opt for a digital shop floor versus a paper-based system will require some sort of computerized device on the shop floor for relaying information (BOMs/instructions) and collecting data (time collection). Before selecting a specific device, it’s important to understand exactly what information will be displayed and collected. Often diagrams and instructions will be displayed on the screen and this information can take up a lot of real estate. Opting for a device, like a tablet with limited screen space, can restrict the amount of information that can be easily viewed on a screen. A better alternative to tablets on the manufacturing floor is fixed or mobile stations that include a computer with a rugged keyboard and large display. In the event a tablet makes the most sense for you, it is highly recommended to select an industrial tablet versus a consumer grade option. Consumer grade tablets are not designed for rugged environments and, in the end, will come with a higher total cost of ownership. Are small devices with a touchscreen a good choice? Comparing a “smartphone” style device to a rugged mobile computer with a pistol grip. The devices are generally not as ergonomic as dedicated mobile computers with a larger non-screen area to hold or with pistol grips. Users tend to have to hold the smartphone-type devices by the edges, increasing the risk of dropping them and making them more awkward to use. The devices are difficult to use when wearing gloves (wearing gloves in the warehouse setting is common practice). Typing using a touchscreen keyboard is very cumbersome when using gloves, not to mention, conductive touchscreen-compatible gloves would be required. Typing using a touchscreen keyboard is more difficult compared to a tactile keyboard. Whether you’re using a finger or stylus to enter data, excessive typing on a touchscreen during a work shift is inefficient. The screens are “capacitive” rather than “resistive”. This makes them more prone to accidental inputs and requires a capacitive stylus for accurate “taps” (as compared to a normal pen or anything else that can put pressure on a resistive screen). The alternative to a “smartphone” type of device in the warehouse is a mobile computer with a pistol grip and external tactile keyboard. These units are designed for all-day use without straining warehouse workers. Is using a consumer-grade device in the warehouse a good option? Choosing to use a consumer-grade device, like an Apple iPad or smartphone, in the warehouse will depend on what you plan to do with it. Imagine going hiking in freezing arctic temperatures. You can choose a standard winter boot but you’re going to be much better off with purpose-built hiking boots rated for extreme temperatures. Generally, consumer-grade devices are not designed for a rugged environment meaning they won’t handle the abuse devices are exposed to in the warehouse. No matter how careful a worker is, devices get dropped and knocked and consumer-grade devices get damaged very easily. Warehouse devices need to make it through a work shift and when operations run around the clock, batteries need to be replaceable between shifts. Most consumer-grade devices don’t have replaceable batteries with battery sled options. Third, warehouse management systems can display large amounts of information on the screen of the mobile device. Consumer-grade devices typically feature a touchscreen keyboard. This keyboard takes up screen real estate leaving less room to consume information. Fourth, the screens are “capacitive” rather than “resistive”. This makes them more prone to accidental inputs and require a capacitive stylus for accurate “taps” (as compared to a normal pen or anything else that can put pressure on a resistive screen), and cannot be used with standard work gloves. Finally, using a mobile device all day long can become a strain and so ergonomics play an important role. Consumer-grade devices are not ergonomic like a purpose-built mobile warehouse device – for example, a mobile computer with a pistol grip. When do I need to consider a long-range scanner? Not all scanning is created equally. Generally, there are mobile computers with standard-range and long-range scanners. Depending on your application, you need to select the right device for the job. Generally speaking, most standard-range scanners scan at “arm’s length” (roughly 2 to 24 inches, possibly slightly more based on device model). If you need to scan barcodes further away, then you need to consider a long-range scanner. Depending on the model of the scanner, long-range scanners can scan up to 30 feet away and some are even designed to scan as far as 70 feet. When it comes to long-range scanners, the size of barcode and the type of material the barcode is printed on will play a factor. Scanning extreme distances may require a retro-reflective barcode label. Long-range scanners can also scan at shorter ranges, so can be used as both a long-range and standard-range scanner. However, there is often a short delay when the scanner “re-focuses” to a new range. The delay introduced by the re-focus is generally very small but may be noticeable. Consult with your Automated Data Capture (ADC) hardware specialist to understand the hardware options available based on your specific needs. Should I be concerned that my operating system is reaching its end-of-life support by the manufacturer? First, when it comes to mobile devices to manage warehouses, the devices are purpose built. In other words, they are designed to perform specific tasks. The expectation to have devices do more or different things over time doesn’t exist in the warehouse environment. Unlike personal or work computers, or consumer phones, the hardware and operating system is designed to cater to what the user wants to do at any given time. A user’s need will evolve and that can have a demanding effect on the expectations of the operating system. This is not the case with a mobile device in the warehouse. The second consideration is there is no need for an operating system on a warehouse device to evolve. A mobile computer used in the warehouse is designed to scan and interface with a warehouse management system – that’s generally it. Users of warehouse devices are not installing new applications nor are they downloading files from the internet, as such, mobile devices are not susceptible to the types of security issues and viruses other devices are. Once configured, there is little need, or incentive, to change the purpose of a warehouse mobile device. Finally, the proof is in the pudding. Windows CE 5 was released in 2004, and Microsoft ended its mainstream support for it a decade ago (in 2009). Yet there are still tens of thousands, likely many more, devices still out in the real world performing daily tasks. Those concerned about the end-of-life of their operating system shouldn’t lose any sleep, rather, refocus and strive to lower their Total Cost of Ownership (TCO). If it ain’t broke – don’t fix it. Get as much mileage out of your mobile devices as possible. If you are interested in an Android device or newer Windows device, DMS iTech carries a full line of mobile computers compatible with Warehouse Insight. When should I consider upgrading my mobile warehouse device? In the world where technology is moving at lightning speeds, people naturally look towards better technology to replace what they currently have. Reasons to replace current technology vary including wanting new features, faster speeds, a cool new color or simply the need to have the latest. 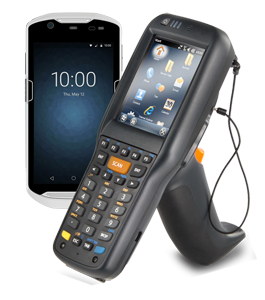 When it comes to existing mobile warehouse devices such as handheld scanners and mobile computers, the focus should be on maximizing the total-cost-of-ownership (TCO), rather than emphasizing the need to replace equipment. Warehouse devices, for example, a mobile computer, are built for a very specific purpose. As a result, the expectation of the device to change and do something different over time does not exist. Therefore, companies need to strive to get as much mileage as possible from their warehouse devices and drive down their TCO. Using an old operating system, or an operating system that is no longer going to be supported by the manufacturer should not force companies to upgrade their equipment, as long as the device continues to execute the applications required in the warehouse. If your current mobile devices are getting the job done, then keep using them until they no longer function properly. The emphasis should be on TCO – not replacing equipment. What are my options when it comes to a computer station on the shop floor? Manufacturers moving from a paper-based to a digital process on the shop floor have a number of options when comes to choosing a computer to relay and capture information. Standard PC with or without a touchscreen: Computers used in conjunction with Insight Works’ add-ons don’t require a lot of processing power because the add-ons are lightweight. An older computer can typically get the job done. If the computer is placed in a harsh environment, an enclosure may be required to protect the PC. Thin Clients: A thin client, like a Chromebox, can be a good option too. A thin client is a stateless and fanless computer terminal that does not have a hard drive. When it comes to Insight Works’ add-ons for shop floor management, all that is needed is a browser so thin clients are a good option. They are relatively inexpensive. Some users choose to run a touchscreen monitor with their thin client. Stick PCs: Stick PCs are becoming more popular. These are very small computer sticks which typically have an HMDI port. Stick computers take up very little space, are relatively inexpensive and can be purchased with Android and Windows operating systems. Couple a stick PC with a touchscreen monitor and you have a great shop floor terminal. Industrial Touch Screens: Industrial touch screens are available with a built-in computer. As you can imagine, because they are industrial, these screens are made for rugged environments. They are made for the shop floor however you should expect to pay more than other options. Tablets: Depending on your manufacturing environment, a tablet may be an option. The screen size of tablet options is often smaller than that of a computer monitor. If you have instructions, diagrams or other large amounts of information to share with users, a tablet screen size may be limited. Also, consumer-grade tablets are not recommended. If you choose to use a tablet, select from industrial grade/rugged tablet options. TCO stands for Total-Cost-of-Ownership. TCO is the purchase price of an asset (like a mobile computer) plus all costs associated with the asset over the entire life of the asset. When selecting a device for the warehouse, the goal is to find an option with the lowest TCO, which may not be the device with the lowest purchase price. When selecting a mobile device, factors including the cost of worker downtime if the device is damaged or unreliable, accelerated replacement cycles, additional accessories, and support all make up the TCO. It’s important to know the environment in which your mobile devices will be used. A busy warehouse can take a toll on mobile devices not designed for a rugged environment. Dropping and damaging consumer-grade devices can cause worker downtime, delays in productivity and replacement costs resulting in a high TCO. Purpose built warehouse scanners used for three to five years will often have a lower TCO.